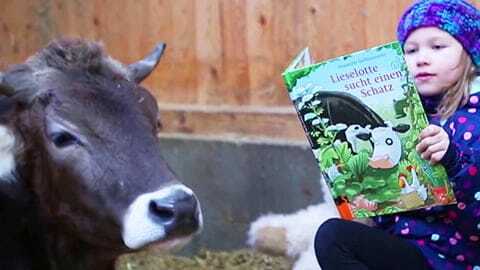 This happy cow video shows what a truly happy cow looks like. Diane the cow was rescued from a dairy farm and now she is able to live her life freely and happily at Farm Sanctuary. When she was at the dairy farm, Diane was forcefully impregnated and her babies were taken from her. This is done in all dairy farms since cows, like all mammals, only have milk after giving birth. The babies are taken shortly after birth to prevent them from nursing the milk. In this video you can see Diane doing her routine happy cow dance for her rescuer, Susie Coston, a director at Farm Sanctuary. Farm Sanctuary is a US-based rescue & protection organization for farmed animals, founded in 1986. The organization was America's first sanctuary for farmed animals. Among others things, the organization promotes a vegan diet through rescue, education, and advocacy.